We are so excited to announce a new yoga class we’ll be teaching together in our South Philly neighborhood – Intro to Yoga at DiSilvestro Playground! Meets the first 4 Saturdays in June from 10:30-11:30am. Price is $45, which includes a yoga mat! For the first four Saturdays in June (1st, 8th, 15th, and 22nd) join Team Sun Wellness at DiSilvestro Playground’s indoor space for 4 gentle one-hour yoga sessions aimed at beginners, but open to all levels. 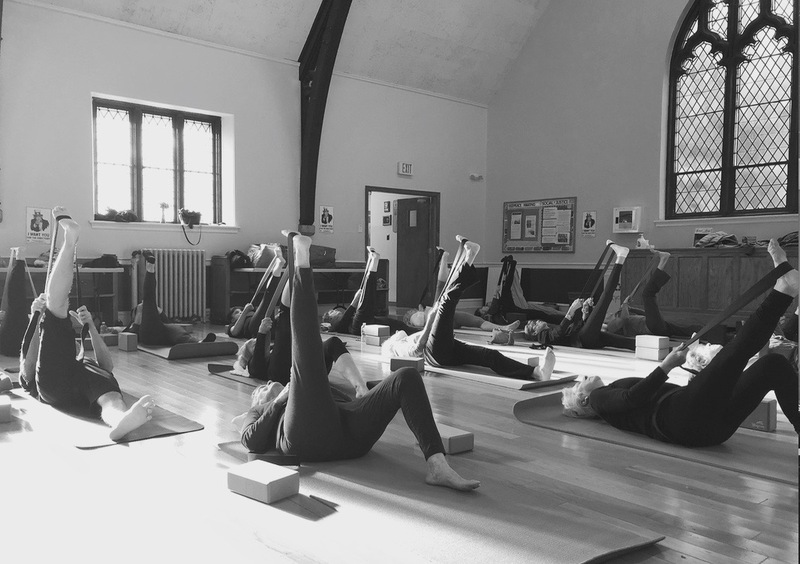 During our sessions, we’ll explore a variety of reclining, seated, and standing postures and the transitions between these poses – adapted to your level. Our accessible sequences are designed to create balance between mind and body by connecting the movement with breath. Blocks and straps provided to help safely attain or deepen poses. Class size limited to 25. About the Instructors: Ann and Brian formed Team Sun Wellness in 2015, joining forces to help people of all ages and walks of life take care of themselves through mindful movement and focused breathing. Both certified yoga instructors, Ann and Brian are passionate about bringing the principles of yoga – physical postures, meditation, and breathing – to populations outside the typical yoga studio space. We offer affordable classes in community and private settings where participants can feel supported while safely finding their own practice…and we have fun while doing it! We’re bringing you some special offerings in May and hope to see you come out for something a little different! All workshops meet on Saturdays at Wallingford Presbyterian Church, Fellowship Hall. Click on photos for more. 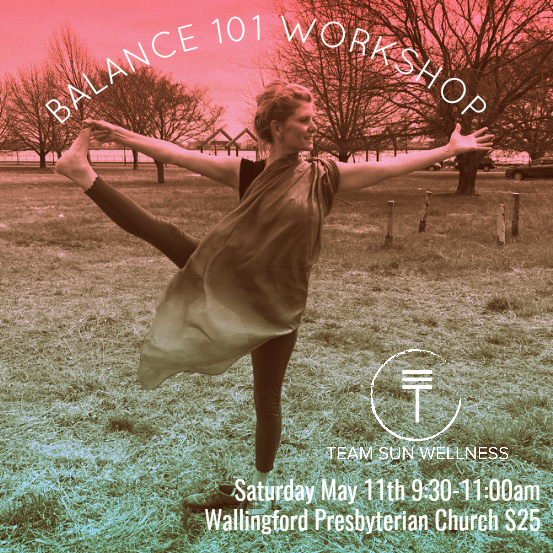 Saturday May 11th: Join us for a fun workshop all about balance! Explore new ways to assess and improve your balance. 9:30-11am / Wallingford Presbyterian Church. Evaluate our balance using a timed exercise. Get mindful: create a mind-body connection by focusing on the breath to improve awareness. Get in touch with our feet, the foundations of balance. Learn new postural habits: good alignment means stability. Stretch and strengthen muscles used for balance. Learn new visual habits: lift the gaze to encourage use of peripheral vision. Practice increasingly difficult balance challenges in a supportive, non-judgmental environment – such as: standing yoga balance poses, walking a balance beam, ball-handling, and other exercises that challenge our balance. Explore the “edge” of our balance ability. Celebrate our victories no matter how small by supporting and encouraging each other! Participants of all ages and mobility levels welcome. Chairs will be provided, and if you have a yoga mat, please bring one. (Or borrow one from Team Sun Wellness, supplies limited) We will be placing chairs on the mats to create a non-slip surface. In addition, there may be an opportunity to practice more advanced standing yoga poses depending on participant’s interest. Class size limit 30. About the Instructor: Ann MacMullan Jeans is a certified yoga instructor (EYT-200) and teaches yoga, meditation, and balance classes in the Philadelphia area with her company Team Sun Wellness. Unwind with this gentle but challenging ancient form of exercise. Learn basic yoga asanas or postures to improve strength, balance, and flexibility while focusing on the thread of the breath that “yokes” the mind and body together. Whatever your age or level of fitness, you’re welcome to join this accessible yoga class with a real group spirit. Come practice with strangers and leave as friends! And we’ll be adding more anatomy to our classes during the months of May and June! Classes meet at Wallingford Presbyterian Church, an exceptional venue with hardwood floors and stained glass windows, and a feeling of sanctuary for all kinds. Class size limited to 35. Either sign up for all 5 sessions, or drop in for $15 to one. 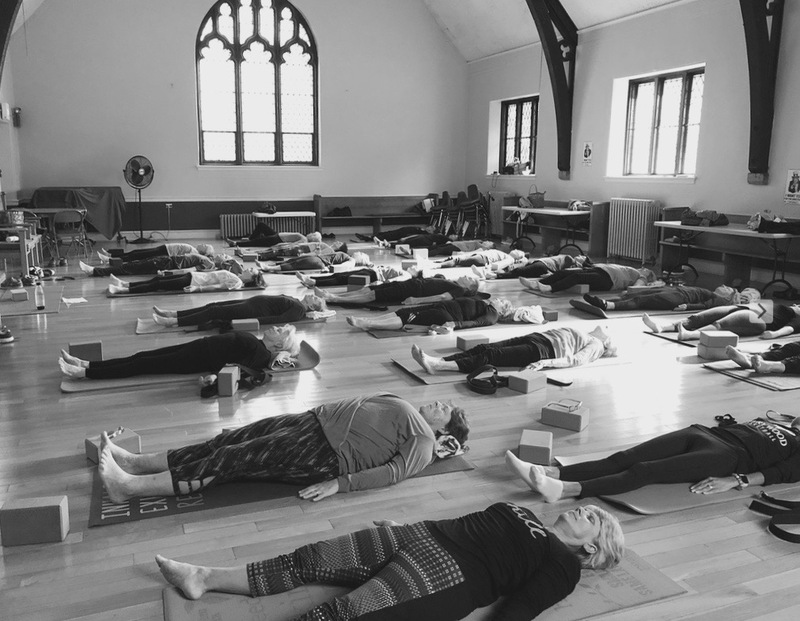 About the Instructor: Ann MacMullan Jeans, a native of Swarthmore, is a certified yoga instructor (EYT-200) and teaches in the Philadelphia area with her company Team Sun Wellness. Ann believes in the healing power of yoga and meditation for everyone, no matter what age, level of fitness, or life circumstance. For more information, email Ann at info@teamsunwellness.com. “I have attended classes with Ann, participated in workshops, and worked with her in private sessions. Ann senses what each individual needs in all of these different settings. She is perceptive, insightful and kind. Yoga has helped my balance and focus. I wholeheartedly recommend her.” – Amy S.
Gentle Yoga: “Gentle” refers to an attitude of taking exquisite care of ourselves in each moment throughout our classes. 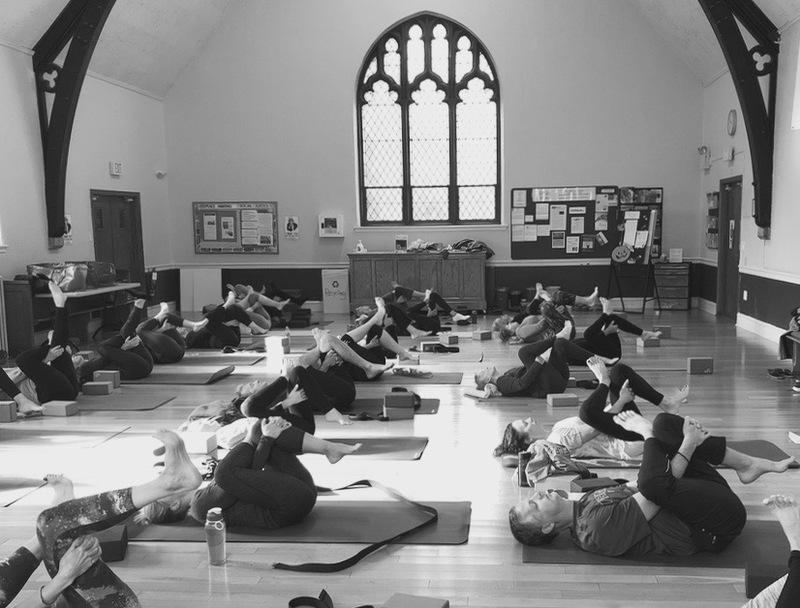 We’ll explore a variety of reclining, seated and standing postures and the transitions between those poses, adapted to your level. 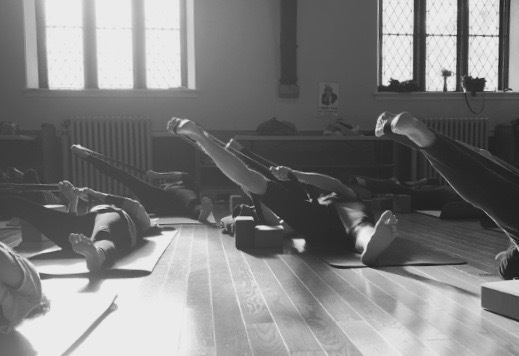 In addition, we’ll learn more about the limbs of yoga beyond the physical postures, such as meditation and breath-work And we’ll be adding more anatomy to our classes during the months of May and June! These sessions are accessible for all ages and levels, and blocks and straps are provided to help deepen and achieve poses. Bring your own mat (or borrow one, supplies limited.) Classes meet at Wallingford Presbyterian Church, an exceptional venue with hardwood floors and stained glass windows, and a feeling of sanctuary for all kinds. Class size limited to 35. Either sign up for all 5 sessions, or drop in for $15 to one. “I have been a grateful student in Ann’s yoga classes for a couple of years. As an older yoga practitioner who has worked with other teachers in the past, I have especially appreciated her non-judgmental and very encouraging approach. Her classes offer increasing challenges for students to stretch their bodies and their repertoire of yoga poses, but always in a compassionate, supportive, and peaceful atmosphere. In addition, her subtle humor and intention to connect personally with her students makes practicing yoga just plain fun. As Ann expands her teaching opportunities, I hope to follow her for as long as I can move my body!” -Judy S.
Did you miss registering for the WSCC class that meets on Tuesdays because it filled up too fast? Or are you signed up for Tuesdays and you want to practice Gentle Yoga with me twice a week? Or maybe you’re new to my classes and you’d like to try something different. Good news! I’m adding a second opportunity to practice Gentle Yoga during the spring session. This venue is exceptional for its beautiful Fellowship Hall with hardwood floors and stained glass windows, and its feeling of sanctuary for all kinds. You’ll find an age range from twenties and thirties all the way into the eighties! “Gentle” refers to an attitude of taking exquisite care of ourselves in each moment throughout the class. We connect the breath with movement during accessible yoga sequences designed to create balance between mind, body, and spirit. We’ll explore a variety of reclining, seated and standing postures (asana) and the transitions between those poses, adapted to your level. In addition, we’ll learn more about the limbs of yoga beyond asana or the physical postures, such as meditation (dhyana) and breath-work (pranayama.) Props like blocks and straps are sometimes used to help safely attain or deepen a pose. Blocks and straps are provided. Class size limited to 35. Spring registration is now open for Wallingford Swarthmore Community Classes. Each of the classes I’m teaching spans eight weeks, starting in the first week of March, and since classes typically fill up fast and often have waiting lists, try to secure your spot. WSCC is a non-profit organization that provides a range of adult classes at a low cost in community venues. I feel lucky to be one of their teachers in the place where I grew up, where most of my family still lives, and where I do most of my teaching. I have met some extraordinary souls (some of whom I already knew, or went to high school with their kids!) and each venue brings its own set of community-minded folks to the mix. Prepare for the holidays by wrapping yourself in the grace and joy of yoga. Our lighthearted yoga sequence is safe for all levels, even total beginners and kids! Combat the winter blues and stress of the holidays by meeting yourself fully on the merry mat. Light refreshments and community connection to follow. A percentage of the proceeds will be donated to ABC Strath Haven. Admission is free for ABC students, staff, and host families! Bring your own mat, some extra mats provided. Practice simple breathing techniques for taming stress and building energy. Fuse breath with movement to achieve a state of balance. Explore the process of staying present during a variety of reclining, seated, and standing postures. Play with the pulse of movement within yoga poses and enjoy extended transitions between poses. Delve into how to navigate moments of resistance we might experience during a yoga class, and find ways to move through potential distractedness, judgment, new physical sensations, or anxiety. Be encouraged to listen to our own needs by turning down the noise of the mind and accepting whatever thought or feeling is in the foreground. After our yoga practice, feel free to stay and connect with fellow members of the community and enjoy some light refreshments and music. Class size is limited to 35. To register, email info@teamsunwellness.com and secure your spot. When you pre-register, you’ll have the chance to enter our raffle to win a free spot in your choice of the group sessions scheduled for January! For more information on when those classes meet check out our Wellness Offerings. Two winners will be announced after class. If you have already registered for a group class and you win, you’ll be refunded. About the Instructor: Ann MacMullan Jeans, a native of Swarthmore and a Strath Haven HS alum, is a certified yoga instructor (RYT-200) and teaches in the Philadelphia area with her company Team Sun Wellness. Ann believes in the healing power of yoga and meditation for everyone, no matter what age, level of fitness, or life circumstance. “Ann is an excellent teacher who knows yoga. More importantly, she is attuned to the abilities of her students. She adapts the practice so that we can safely participate and gain from the experience. It is a true gift.” – Amy S.
About ABC Strath Haven: The mission of A Better Chance Strath Haven is to provide a supportive, nurturing environment for promising, motivated students of color from underserved communities to help them develop personally and academically as they prepare for college. Join us at 12:00pm on the Saturday after Thanksgiving for an all levels Gentle Flow class! We’ll breathe, stretch, and move to restore precious vitality. This class is safe for all levels: whether you’re a total beginner, haven’t gotten to the mat in a while, or have a regular practice. Show up in whatever state you are in, and be guided through an accessible fun sequence designed to connect mind, body, and spirit. Blocks and straps are provided, and some extra mats are available as well. $10 to drop in or use your existing class card. “I have been a grateful student in Ann’s yoga classes for a couple of years. I have especially appreciated her non-judgmental and very encouraging approach. Her classes offer increasing challenges for students to stretch their bodies and their repertoire of yoga poses, but always in a compassionate, supportive, and peaceful atmosphere. In addition, her subtle humor and intention to connect personally with her students makes practicing yoga just plain fun. As Ann expands her teaching opportunities, I hope to follow her for as long as I can move my body!” -Judy S.